Good Day! I thought I would show you my "find" from several years ago. I was driving through a small town near us and saw that an antique store was closing its doors. In the lower floor, way back in a corner was this wonderful piece of furniture! It is actually four parts - the top, and three sections. I call it my 56 Drawer Quilting Chest because, of course, there are 56 drawers. I did some research and found that it came out of the Bemis Bag Company in St. Louis. The antique dealers grandfather worked there, and when the company moved, this was going to be thrown out. He was allowed to take it, and it moved with him to Washington State where it sat in his barn for many years. (Yes, I had to do a bit of cleaning, but it still has it's original finish). 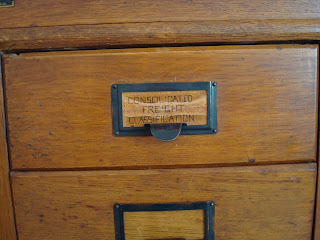 Below is a picture of the one remaining drawer label. The chest was used in their shipping department - there are even a few tariff documents for Union Pacific Railroad left in one drawer! Now the really neat thing about this chest is that when you open a drawer, the front of the drawer is hinged and folds down allowing you to see what's inside without opening it all the way! 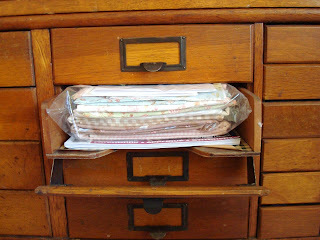 After I cleaned it up, I lined each drawer with some paper. The other REALLY neat thing is that each drawer, no matter whether it is one of the large, medium or small sizes, is interchangeable in any space! So the drawers can be placed in any number of configurations! Someday I plan to label each front using a pretty linen paper and calligraphy. Right now I use an Excel spreadsheet to keep track of what is in each one. 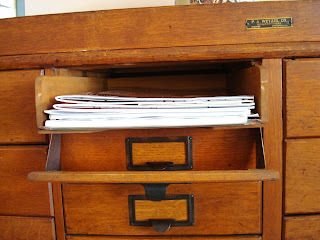 This one below currently holds quilting books, many of the smaller drawers hold quilting magazines, some have stash, fat quarters, others have BOM's waiting to be done...with 56 drawers there is a LOT stuffed in them! Oh look - I wonder what's in this one - why it's the kit for Anne Sutton's The Bunny Run Quilt and the Australian Homespun issue that contains the pattern! I sure love Anne's creations - be sure to check her out over at Bunny Tales. WOW! What a treasure. 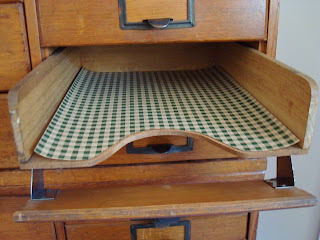 How fun to have all those nooks and crannies! Wow, I'm jealous. That is a GREAT find. 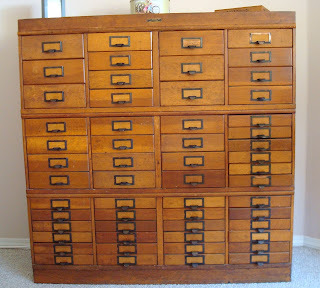 I love map cabinets and stuff with lots of drawers!